Isn't it great! 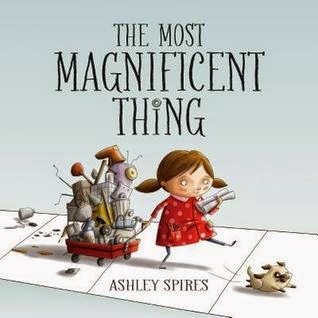 There are lots of details in the illustrations as she makes her attempts to construct the magnificent thing. I love this book. The struggle for perfection can stop kids from achieving. So true! That can happen to writers, too. Such a great cover. The girl looks confident and determined. Important theme that it's okay to make mistakes so they don't give up! Like your thoughts as a writer and a teacher. Great choice. Good point about the theme, Patricia! Hi Andrea...so happy you posted in Susanna's link up...I love your blog and I love the book you picked for PPBF. With a main character who has no name, this certainly sounds like a picture book that breaks some of the rules...can't wait to read it! Aw...thank you Vivian! It's always great to hear positive feedback about my blog. I love the idea of PPBF and I hope more teachers hear about it and begin using it. It is really interesting to learn from books that break the rules a little. I too love the doggy assistant in this text. The humor and perseverance pervade the pages. My class really enjoyed this book, since they are always making things at the "construction centre." The humor is great! I still get frustrated by the same things! Thanks for sharing, Andrea. I keep meaning to look at this, but somehow it keeps slipping to the bottom of the list. Thanks for the reminder. This is such a fun book to read - and I just love the cover. Creating magnificent things from junk is tough, but creating the "most" magnificent thing.... that's even tougher. A great book for kids of all ages. Yes! Frustration is such a huge stumbling block to creativity--this sounds wonderful. I can recall crumpling up multiple projects as a kid.